Welcome to another sponsored post for the Idaho Potato Commission. I love working with them because they are great people, and I get to cook with potatoes. That’s a win-win every time! 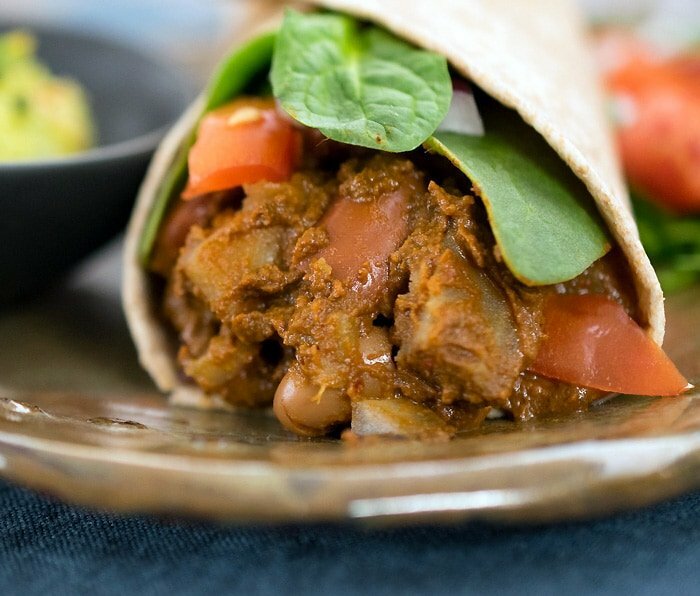 I have a super-flavorful recipe for a Vegan Slow Cooker Potato and Bean Mole for you just in time for the weekend.
. 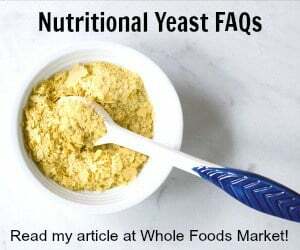 Many regular grocery stores will have packages of them in their international section. In fact, I just got some from my local Aldi’s. You can also get them online or at a Latin grocery. In my area, that’s Compare Foods. Once you have those chilies right in your hand, you need to open them up and take out the seeds and stems. The chilies we are using here aren’t very hot, but you can always wear gloves to make sure you don’t transfer the chili oils anywhere unpleasant. I always seem to want to touch my eye. Next you’ll toast them in a dry skillet until they become fragrant. Then you’ll put them in a pan of water and reconstitute them. After cooking, they will puree easily and smoothly with the other mole ingredients in your blender. See how easy that is? And it’s the hard part. I love this recipe! 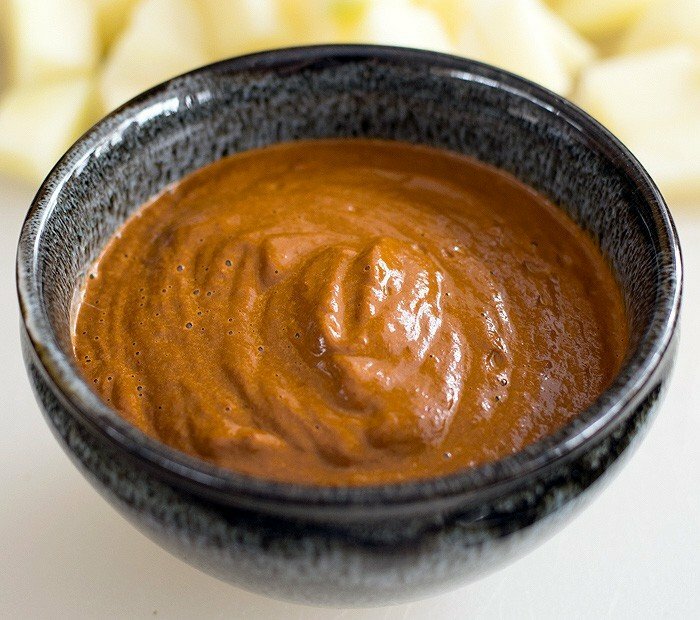 All you have to do is mix the sauce with the cut potatoes and cooked beans and cook on low 7 to 9 hours in your crockpot. When you come home, you can either steam some rice or break out the tortillas. I like to have a variety of toppings out on the table. You could do a few or all of these: spinach, lettuce, tomatoes, red onions, salsa, guacamole, and a variety of salsas. This is a hearty dinner that’s perfect for a winter night. Let cool, then remove the seeds, stem and ribs and discard. Place the flesh of the pepper in a small saucepan and cover with water. Bring to a boil, then lower heat and simmer for 10 minutes to reconstitute. Then take the pan off the burner and set aside for later. Heat the oil in a large saute pan over medium-high heat. Once hot add the onions and saute until translucent. Stir in the garlic, cumin, allspice and cinnamon and cook another 2 to 3 minutes, until the spices become fragrant. 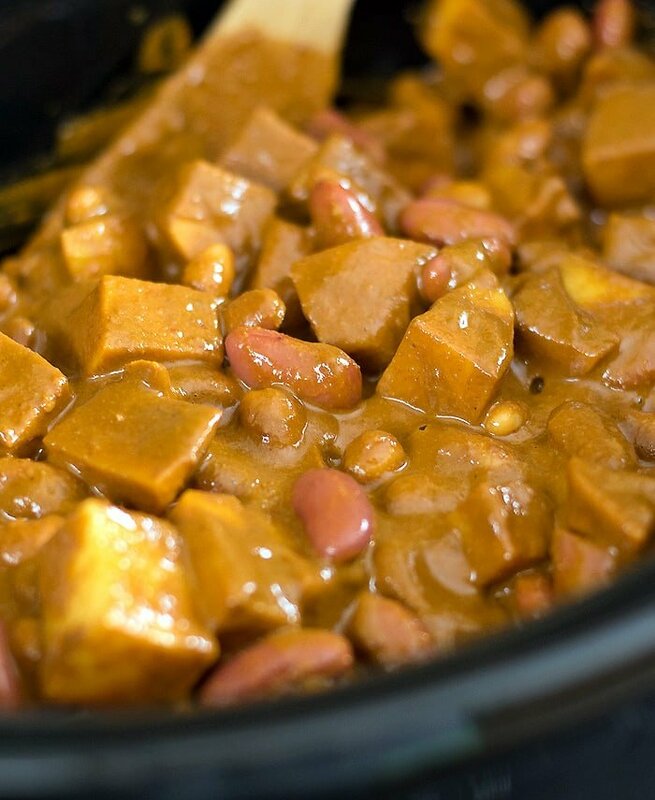 Add the Idaho® potatoes, beans and the sauce ingredients to your 3 to 4-quart slow cooker. Cook on low 7 to 9 hours on low or 4 hours on high. Note: If you may be home late add an extra 1/4 cup water to make sure the filling doesn't burn. Serve over rice, in tacos or burritos. « Vanilla Gluten-free Vegan Pizzelles Made with Teff Flour! OMG this looks so yummy, I wanna grab that role out of the screen and just munch on it. Great recipe ! I never thought to make a bean mole! So creative! Your photos are gorgeous. I want a burrito, like, NOW. 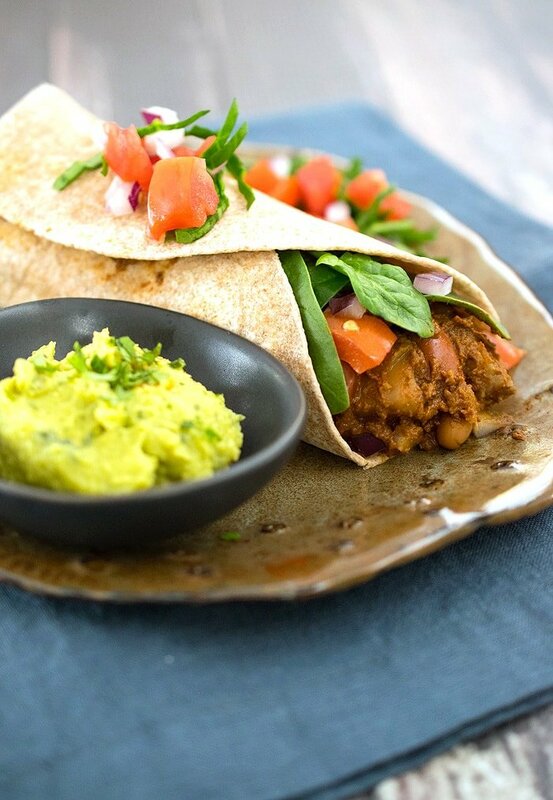 I adore Mexican food and am always looking for more meat free ways to enjoy it. These look superb! The* ahhh, worst typer ever! Looks delicious. The depth of flavor must be incredible. Pinning to try! This sounds yummy. Your sauce is so smooth and on point. I was always under the impression that mole is going to be a messy, difficult thing. So I just used to leave it for the professional. This recipe looks extremely inviting. Just a question, I do not own a slow cooker. How can I adapt this recipe for stove top / oven? You would add the sauce, beans and potatoes to a covered saucepan and simmer until the potatoes are tender. You will probably need to add extra water since you’ll probably get more evaporation. 1/4 teaspoon cinnamon. Be sure to let me know how it goes. We made it last night and it was perfect … rich, complex and delicious! 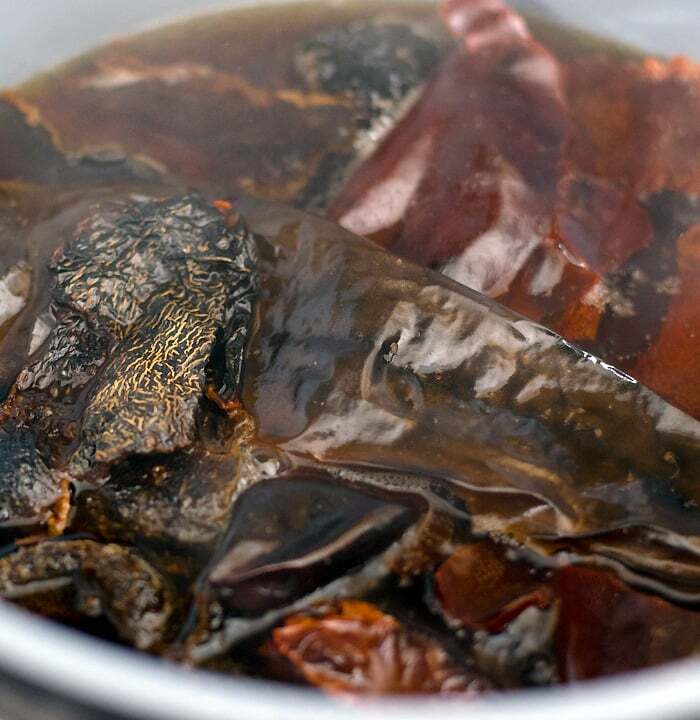 And, you were right … the chiles were the hardest part, and not all that hard at all. We included toasted pepitas in our “toppings” and served it with a tortilla. Thank you for sharing such wonderful and nutritious vegan options with us … I used to tuck my crock pot in the closet between uses, now it stays out on the kitchen counter awaiting your next recipe! You made my whole day!! I love the idea of topping with pepitas! This looks fabulous, Kathy! I love a mole, and your recipe looks so delicious and easy! I love potatoes and I put them in burrito type things often. this sounds so flavorful! I have the szechuan dried chili, can I use them and how much do I use? They would not be good to use in this. You really need the mild chilies called for to make the base. You could add a little Szechuan dried chili to make the mixture hotter though. If you just used them though it would be too hot for 98% of people to eat. How do I alter this to be UWL compliant? Can I use white beans or a roasted onion in place of the blanched almonds & how many dates can be used as a substitute for the maple syrup? Thank You! You could use rolled oats for the almonds and I’m not sure how many dates you’d need. I would start with one, taste, and add more if needed.